Want to make your gift even happier? Tie a Yellow Satin Ribbon around it! With double faced satin (the smooth satin appearing on both sides), you’ll have the perfect accessory to your already exciting gift wrap. 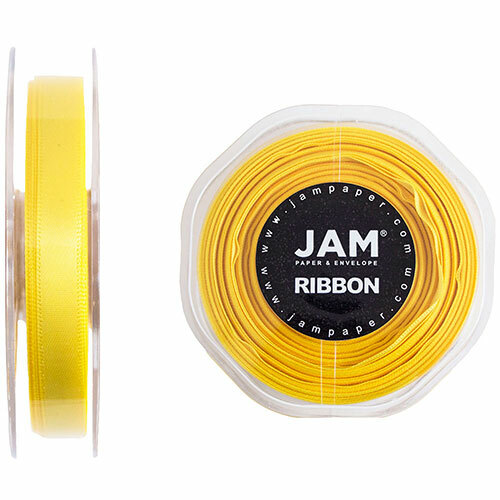 Whether you use this ribbon to tie up your gifts, create some crafts, or decorate a sun shining party, this yellow ribbon is sure to help you out! The bright yellow color and the smooth satin exterior are certain not only to please the eye but the hand too. Easy to tie in a bow, this satin ribbon will surely make a person happy to unravel it (or maybe even the opposite – so nervous to destroy such a masterpiece!). Yellow Satin Ribbon measures 3/8 inches, 7/8 inches, or 1 1/2 inches in width. So whether you want a big bow or a small, we have you covered. Satin Yellow Ribbon all come in 25 yard spools.